The position that you are interested in is already filled? Sign up for our Job Alert and we will notify you when a position is available. The Agritex Group offers an annual allowance for the purchase of work boots. 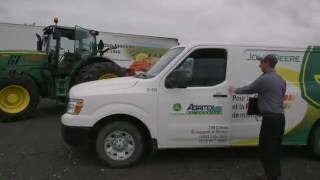 The Agritex Group offers an annual allowance for the purchase of work equipment. The Agritex Group offers a group insurance plan that covers medical and paramedical fees (individual or family plan) to which the employer contributes 50 % after three months of service. The Agritex Group provides group insurance that includes long-term disability insurance to which the employer contributes 50 % after three months of service. The Agritex Group provides group insurance that includes life insurance which the employer contributes 50 % after three months of service. The Agritex Group offers collective travel insurance for emergency medical care outside the province (individual or family plan) to which the employer contributes 50 % after three months of service. Our holiday schedule is established to allow you to spend significant time with your family and friends. Up to 10 mandetory holidays are recognized. The Agritex Group recognizes that each employee plays an important role in our business’s success. Whether it be an introductory dinner, a BBQ or a Christmas party, we organize several events during the year to highlight the good work of our team and to thank our employees for their dedication. The Agritex Group holds a particular importance to having a skilled workforce. Whether online or in class (St Hyacinthe, Ontario, Florida, etc.) several courses are offered on various products and equipment. At Agritex we believe in advancement! We hire students to enable them to gain experience in the field. The possibility of paid internship depends on the area of study and available positions within the company. Consisting of 12 locations, The Agritex Group is constantly changing. Wanting to offer excellent service, our team includes several specialists so that we can meet the specific needs of our customers. No matter the position, opportunities for advancement and changes are numerous. When we hire someone who was referred to us by one of our employees, we provide a bonus to the for mentioned. Agritex provides psychosocial support service for its employees. It is a professional and confidential service to help employees who need support or to spot an impending problem. Services are available 24 hours a day, 7 days a week. After three months of employment, employees of The Agritex Group are entitled to discounts on products sold at the parts department. Agritex employees, spouses and children 16 and over are entitled to a discount at Energy Cardio. The Agritex Group offers a voluntary retirement savings plan to which the employer contributes for employees with more than one year of employment. We offer competitive salaries, because we want our employees to be motivated, and have a good quality of life and feel appreciated for their true value. Salaries are adjusted annually during performance evaluations. The Agritex Group provides uniforms to every employee each year. At Agritex, our vacation term begins with five days of vacation after six months service and the number of vacation days increases with the duration of employment, to a maximum of four weeks of vacation per year. *Certain conditions apply, complete details are available upon hiring. Voici une courte vidéo sur l'emploi de mécanicien agricole. BE ON THE LOOKOUT FOR JOB OPPORTUNITIES IN OUR 12 BRANCHES ACROSS QUEBEC. Our teams consist of passionate people and stimulated by the changing environment offered by the world of John Deere. Is to be a trusted partner for our customers to enable them to achieve solutions for their agricultural and business equipment goals. Providing excellent customer service through a motivated staff that have received adequate training and oriented to teamwork. Considering our customers as partners and to always treat them fairly. Satisfying the expectations of the principal supplier in terms of yield. Providing an adequate return to shareholders to allow the Agritex Group to remain at the forefront of customer’s needs.